Tennis is a time-honored racquet sport which has recently grown in popularity, thanks in large part to some of the colorful characters who populate its professional ranks. It can be played either one on one ("singles") or two on two ("doubles"), and on courts made of clay, grass, or concrete. The racquet used in tennis is typically stringed densely and tightly to produce the best lift and the most power from the swing. Older racquets were made of wood, but today, graphite is more prevalent. Graphite produces a lighter, sturdier racquet which is much easier to use and capable of withstanding more punishment during play. Racquet designs have also become much more aerodynamic, thanks to computer-assisted design. Several prominent sports equipment manufacturers make high-quality tennis racquets. Wilson, Head, Prince and Pro Kennex are well-known names, with many being used competitively by the sport's top stars. Andre Agassi, for example, uses Head racquets exclusively, while Venus and Serena Williams both use Wilson when on the court. Table tennis (ping pong) is a popular variation of the game, played on a 9' x 5' hard surfaced table. The sport was once considered a novelty sport for the amusement of the upper class in Victorian England. Today, table tennis has grown into a highly competitive sport which has even been a part of the Olympic Summer Games since 1988. This chain of sporting goods stores features a good selection of tennis balls, racquets, footwear, bags, and accessories. Directory of tennis equipment and supplies retailers in the United States of America. Each directory listing includes contact information, category tags, and a website link. This manufacturer of technologically advanced tennis racquets also features strings, grips, and accessories. Offers a wide range of tennis equipment, including racquets, strings, and grips; tennis balls and sport bags; and tennis apparel and accessories. Designer and producer of a quality line of tennis racquets and bags. 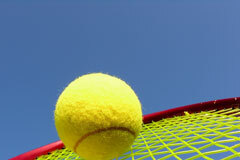 Offers tennis court nets, posts, and accessories.